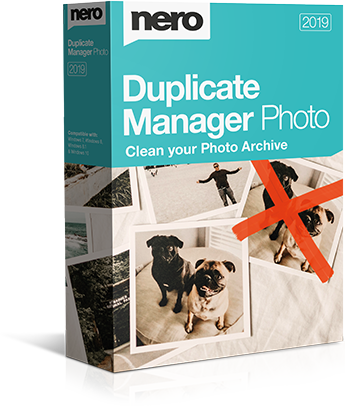 Nero DuplicateManager Photo helps you to clean up your image archive with exact, duplicate and similar images quickly and accurately. Have you archived your photos for years on your PC and connected devices? Now you realize that you have a fairly large number of duplicate and similar images on your PC that take up valuable storage space? Rest assured that you&apos;re not the only one who has this experience. Nero DuplicateManager Photo solves your problems quickly and safely. To resolve your situation, you must first identify your duplicates and then decide which images you want to keep and what should be securely deleted. In many cases this can be very time-consuming. In addition, deciding what to keep and what to delete can be very difficult. 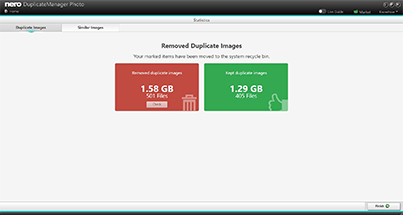 Nero DuplicateManager Photo solves both problems: It helps you clean up your image archive with exact duplicate images and similar images quickly and accurately. 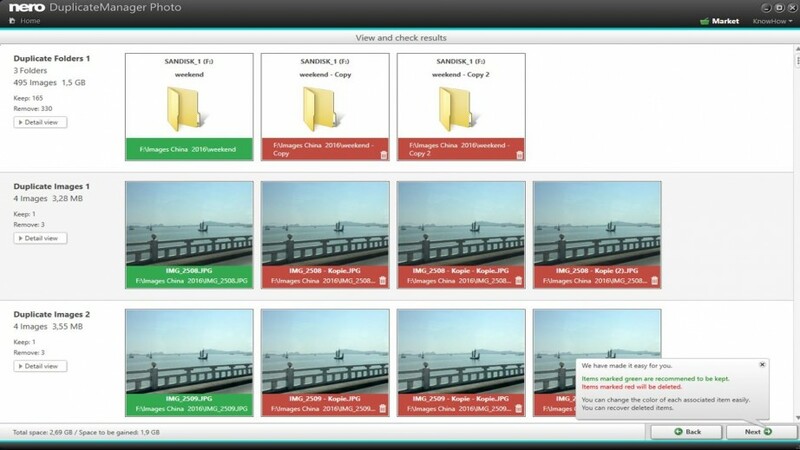 Simply select one or more of your specific cleanup folders and start image recognition. 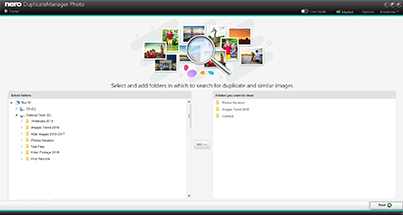 The Image Cleanup mode for exact duplicates shows what you should keep and what you should safely delete, while the similar Image Recognition mode conveniently automatically categorizes your similar images into "Places", "Series", "Motifs", "Resize", "Formats" and more. This makes it extremely easy for you to find, compare and decide which types of similar images you want to keep and clean. Can I clean duplicates on different drives ? Yes, in Windows Explorer like view you can simply select your drives, and folders that you want to have detected and cleaned. You can even add external drives. Can I also identify and clean duplicated folders? Yes, you can simply check detected duplicated folders and find a recommendation which ones are save to delete. When duplicate images are detected, how do I know which ones to clean and which ones to keep? There is a very comfortable visualization for this. You will get recommendations what is safe to delete indicated by the color red. The green color marks what you should keep. What does similar image detection do, and how can I clean similar images? You will probably have many similar images with very similar motives in the archive (Series shots, HDR, etc.) 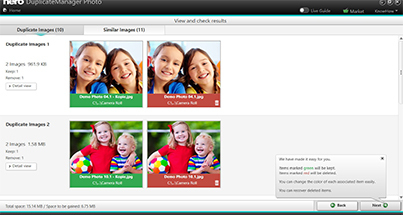 Nero DuplicateManager Photo recognizes all your similar images and categorizes them into categories and groups of similarities. This way you can easily check and decide what you want to keep or clean. Categories are: Places, Series, Motives, Resized, Formats and Other. I do HDR images on my smartphone and also some photo editing with filters on images. Is there a way to identify and clean such similar images? Yes, within the category &apos;Series&apos; or &apos;Motive&apos; you will find these images detected and grouped for cleaning. So you can easily decide what to keep or delete. I am resizing images for sharing. Is there a way to identify and clean these images? Yes, within the category &apos;resized&apos; all these images will be detected and grouped for cleaning. So you can easily decide what to keep or delete. When my images were cleaned, is there a way to restore them? No worries, you can restore deleted (cleaned) images and folders from within the application. The final overview page will help you to verify the cleaning and also provides restore options. 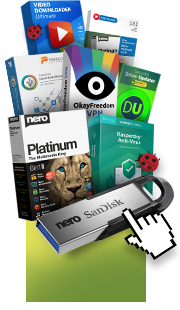 Do not waste your precious time with an inflated image archive and lack of free space on your hard disk. Use Nero DuplicateManager Photo now and get rid of a task that&apos;s long overdue.